» Start/ASF for D21: Different number of WOs for TCC1/2/3. Why? Start/ASF for D21: Different number of WOs for TCC1/2/3. Why? 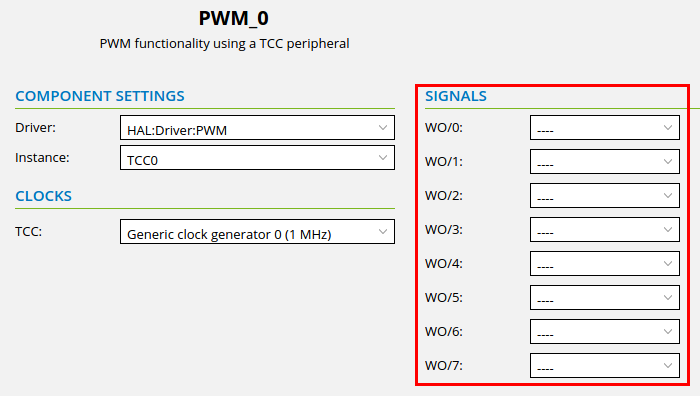 Inspired by another thread/post here, I am "muddling through" the TCC stuff for the D21, playing around with different Start/ASF settings, specifically for PWM generation. After a preliminary read/browse of the D21 data sheet chapter on TCCs I read it as all TCCs have four channels (CC0..CC3) with the output of those routable to eight wave outputs (WO..WO). Can someone with more wisdom and knowledge explain this limitation? Does it change with which particular variant of D21 you use? ie, is it a restriction of the available package pins ... ? Since the Xplained Pro D21 board sports the most "powerful" of the D21s (the D21J18) I don't think (i.e. as in the dreaded "assume") so, but I'll do some experiments. EDIT: Probably not. Same behaviour for e.g. G18 which has fewer package pins. It's hard to understand why there is a difference. It is however documented under 7.2.5 TCC Configurations. Aha! I waded through the TCC chapter only.